Have you ever met people with hypochondria syndromes? 'Hypochondria' refers to a kind of transient and intransient mental conviction (or disorder you might say) that one is likely to become ill when symptoms of any illness are neither present nor likely. Few days before, one neighbour of ours who is Indian by origin and my husband's colleague summoned us immediately to his aid as he suffered some kind of discomfort with his left hand and claimed that he had breathing problems too. Taken his words in all seriousness, we rushed him to the hospital at midnight. After we reached the hospital, it slowly became obvious to us that out friend didn't have any serious discomfort actually. He went to the gym in the evening only for the first time in many years and after coming back home developed a mild pain or 'numbness' in his left hand which he mistook for a symptom of likely heart attack. The doctors made an array of tests on the basis of his description of his discomfort but came out with nothing. It was apparent that our friend actually went through a panic attack. Just a few days before his blood sugar level was diagnosed to be higher than normal. Since he belongs to a family of diabetic patients but never imagined himself to be suffering from any diabetic related health ailment at such young age, the diagnosis of high sugar level sent him into a sudden shock. The shock triggered an anxiety attack in him leading to his imaginary breathing problems and other associated discomforts. As clock was ticking away through the night and none of the test result detected anything seriously wrong with him, he grew more impatient losing his faith in the American doctors and the medical facilities. He was adamant that something was seriously wrong with him and feared he might get a heart attack if he went back home. He almost suggested the doctor to admit him to the hospital immediately, but however, he was discharged somewhat by force of circumstances with an admonition to worry less about his health. He is absolutely 'okay' now. In my family too, I have seen my own elder sister having this kind of anxiety attacks relating to her health with me and my mother pulling her legs and making fun of her behind and in front of her. Ha ha. 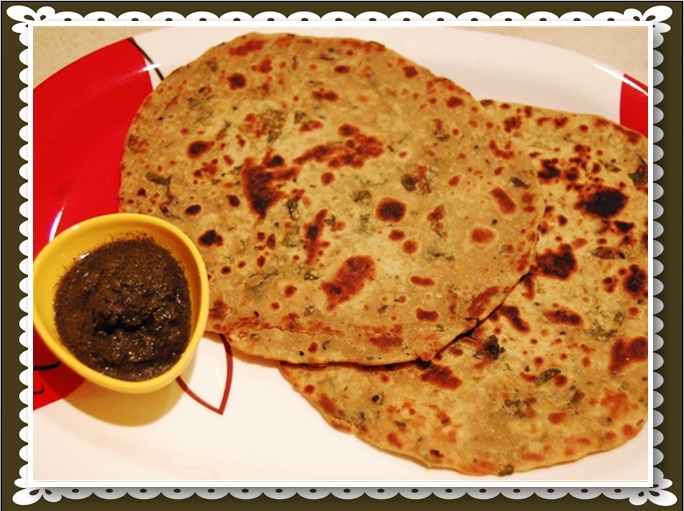 Note: These parathas can be made using all-purpose flour also. If you want you may pour dollops of ghee or butter when roasting the parathas. 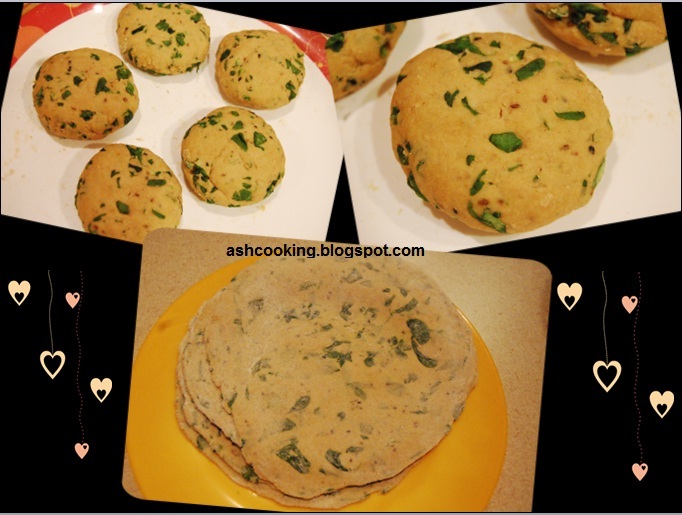 1) Mix in ajwain, sugar, nigella seeds, green chilli paste, salt and fenugreek leaves with the flour. About this time you may add 1 tsp of oil and infuse it gently into the flour. Then knead the flour using required quantity of water. The dough should be pliable enough for you to make balls and roll out parathas. 2) Now as aforementioned, make small balls out of the dough and then dredging them with flour roll out the balls into parathas of circular shape. 3) Roast them in a non-stick skillet using oil, ghee or butter as per your craving. 4) Serve hot with chutney. I had the parathas with sour mango pickle and mint chutney.